When we talk about human rights, freedom and liberty, we often forget that a most fundamental need for human beings is the freedom to access clean water. We need water more than democracy or freedom. Without it we die pretty quickly taking no further part in struggles for freedom. Given the vitality of access to clean water, it would seem that this is something we might expect our governments to provide. We might measure the success of a government by the way it guarantees such a basic need. If between us we create a government that fails in such provision, maybe we should get rid of it and form a new government, one which at the very least could provide clean water. Two quite different governments have access to very large fossil aquifers of water, which are vital to their nation's well-being. In the USA the enormous Ogallala aquifer stretches from the Dakota all the way down to the Texas Pan-handle and is vital for the farming heartland of America (Nebraska, Oklahoma, Kansas …). The trouble is that across the region the wells are drying up, down from an average 240 ft depth to 80 ft. In Lubbock, Texas, wells have dropped from producing 1000 gallons a minute to 100 gallons a minute in only 30 years. The Mid-West dust bowls are returning. You might think the US Government would act to protect and conserve that water. You might think they would stop T. Boone Pickens from taking water from the Texas Panhandle and piping it hundreds of mile to Dallas (forecast to triple in size by 2040). You might think they would stop the practice of Hydro-Fracking used in the extraction of natural gas. Natural gas is the new gold rush for the energy companies and in recent years hundreds of thousands of wells have sprung up across America. Natural gas does not reside in caverns or spaces between rocks, it has to be extracted by horizontal pressure drilling with a mix of water and (mostly carcinogenic) chemicals. Causing miniature underground explosions, each well will use millions of gallons of highly toxic water to blast the rock formations, flooding it's environment with toxic chemicals. Thus hydro-fracking both uses up billions of gallons of water as part of the extraction process and contaminates existing water supplies. Many of the rural populations around these wells find that their water is contaminated, their crops are dying and their cattle are sick. They even find that they can ignite their water as it comes out of the tap (watch it here)! You might think that the Government would help, but you would be wrong – quite the opposite has been the case, with repeal of vital legislation originally designed to protect the natural environment. How might it be done differently - let's look at another country. A country not blessed with the natural resources of America, a country where for large numbers of it's citizens water is hard to come by. A desert country. A country which in the 1950s discovered the worlds largest known fossil aquifer under the desert – the Nubian Sandstone Aquifer. Since then it's scientists have carried out studies about how to extract this water and make it available to it's people. It was decided that, rather than relocate people to the desert aquifer, water would be taken to the people. The Great Man-Made River Project was conceived in the sixties and work started in the eighties – locally funded, without loans from international banks. 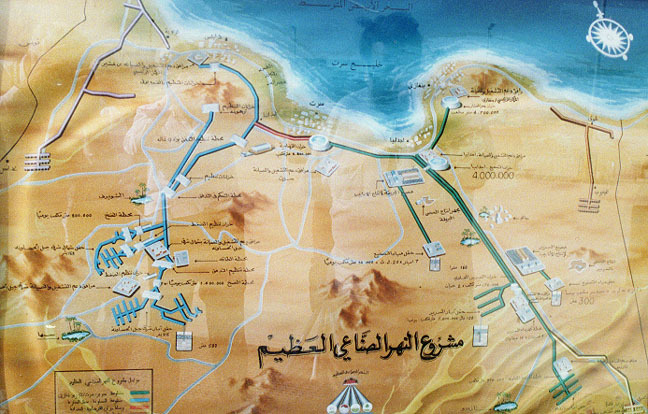 This project, consisting of a massive infrastructure of pipes buried deep under the desert, has been described as the largest water transport project in the world and an eighth wonder of the world. The country is, of course Libya, which now pumps fresh water to all it's major cities (ironically including Bengazi). So we have to ask ourselves, which of these two governments, American or Libyan, has demonstrated more care for it's people and their future. Which has used it's money, for decades, to guarantee that most vital need - clean water?